I am here with a sneak peek of the My Universe stamp/die set which is part of the fabulous April Release from Pink and Main. All new products will be available on 20/04! As always I started with stamping and colouring the cute astronaut and the balloon bunch on alcohol marker friendly cardstock and used my Copic markers to add colour. I kept the colours in the purple-blue-aqua range, this is my favourite colour combo and matching so well the paper I chose as a background from the new Galaxy Foil paper pad. If you are short on time but love galaxy backgrounds with a foil accent, this paper pad is for you. A wide range of pretty skies in beautiful colours – all having rose gold stars as foiled accents. The most beautiful paper pad I have ever seen! I cut a piece to cover an A2 sized card front, heat embossed a sentiment from the My Universe stamp set on a strip of black cardstock and popped it up with 3D foam tape. To make it really dimensional I mounted the balloons with 3D foam tape too and doubled the foam tape up when I adhered the little guy. As a finishing touch I added clear shimmer to the balloons and covered the glass of the helmet and the accents on the costume with glossy accents. I also added some shine to the clouds and the some parts of the planet-balloons too to make it even more special. I hope you liked today’s sneak peek and will check back later for more inspiration! When I saw the Sketch Challenge #432 and the Color Challenge #115 I knew I want to make a card which fits both. I like to challenge myself and combine the tasks, it is definitely more fun! So I started with making my own background by white heat embossing the Roses all over background stamp on a piece of Bristol Smooth cardstock. I don’t have many MFT inks, but I happened to have the 2 blue shades in mini cube format: Cornflower and Blue Breeze. I used a stencil brush to apply the colours and make an ombre background. I usually use Distress inks for ink blending so I was totally surprised how easy and well the hybrid inks blended. Then I chose a cute stamp set, the Birthday Bear and friends, which I have never used before. I stamped and coloured the images with Copic markers, cut them out with the coordinating dies and added some extra detail with a white gel pen. I also used my black glaze pen on the eyes and noses to make them shiny. Of course the balloon and the party hats needed some clear shimmer too. I coated the candles with glossy accents and worked on the sentiments till it was drying. I die cut thin banners from a peach cardstock using the Blueprints 31 die set. Then I took one long sentiment from the same stamp set and stamped it on 3 banners with partially inking the sentiment. When assembling the card I used the grid lines of my Tim Holtz glass mat, it helped me to attach everything straight. I used 3D foam squares, sometimes doubled them up, to achieve a very dimensional result with the critters. I will also link this card to the Simon Says Stamp Wednesday Challenge No designer paper. I am here today with an elegant but oh so cute Mother’s Day card using stamps and dies from the latest release from LDRS Creative. I started with die cutting the Peekaboo Petalette die from heavy weight white cardstock. I cut a few extra flowers too. I cut the edges down so the panel is smaller than an A2 sized card front. I chose a pretty green toned patterned paper from the Polkadoodles Daisy Delight paper pad, cut it down to 4,25*5,5 inches and adhered the floral die cut background to it. I also cut the stitched oval from white cardstock and stamped the cute pigeons from the You are so tweet stamp set with Raven Hybrid ink. I quickly coloured them with warm grey alcohol markers and stamped a sentiment under it with Olive Branch Hybrid ink. After I popped up the oval with 3D foam squares I embellished the flowers with silver pearls. I added a lot, so every full flower has one pearl in the middle. It makes the card so elegant and festive. I hope you liked today’s inspiration. Till next time, happy crafting! It was quite a busy weekend here, but I managed to squeeze in some me-time and coloured some cute critters from Lawn Fawn. I immagined a scene where ducks organise a picnic – I was totally inspired by Peppa the pig, which my kids watch every day at breakfast. So I looked through my really big Lawn Fawn stash – which was a pleasure on its own – and selected stamp sets for my scene: Rub-a-dub-dub, Critters in the forest, Baked with love, Happy summer, Make lemonade, Butterfly kisses, Christmas dreams and So smooth. I coloured everything with Copic markers and cut out with the coordinating dies. Then I took an aqua patterned paper from the Watercolor wishes paper pad as my background, and cut grass from a green toned one. I also die cut a Stitched Scalloped Rectangle frame from white woodgrain cardstock. I assembled the picnic scene and stamped a sentiment from the Rub-a-dub-dub stamp set using black and Merman inks. I adhered everything flat except for the mummy duck and the little duck on the side, for which i used 3D foam squares. I covered the butterflies with a clear shimmer pen, added glossy accents to the beaks and legs of the ducks and emphasized their eyes with a black glaze pen. I also added liquid glue to the bottom of the clouds and coated them with Chunky glitters. I also scattered a bunch of irridescent mini butterflies from Studio Katia. I will upload this card to the Lawnfawnatics Challenge #50 Fun with food and the Simon Says Stamp Monday Challenge Down on the farm. I hope you liked my card today and will check back soon for more fun. Iam here with a simple birthday card which I created with the partial die cutting technique using goodies from Pink and Main. I started with stamping the girl from the Birthday kids stamp set on a 5.5 inch wide white cardstock. I stamped the word Celebrate next to it using 2 shades of pink inks for an ombre look. I also stamped another sentiment above it with black ink. Then I drew the lines where I wanted to cut with a pencil and placed the coordinating die on the girl. I put the upper cutting plate edge along the pencil line, so it cut only the upper part of the image, until the pencil mark. I did the same on the bottom and then I used my trimmer to cut the straight edges. I placed the cut piece on black cardstock and drew a mat using a ruler and the coordinating die. I fussy cut the mat and adhered it to the white panel. I used Copic markers to add colour and adhered it all onto a pretty plaid patterned paper from the Beach Babe paper pad. As a finishing touch I added some glossy accents and white gel pen highlights. I finished it off with a bunch of gold glossy dots. I hope you enjoyed today’s inspiration and will check back soon for more! 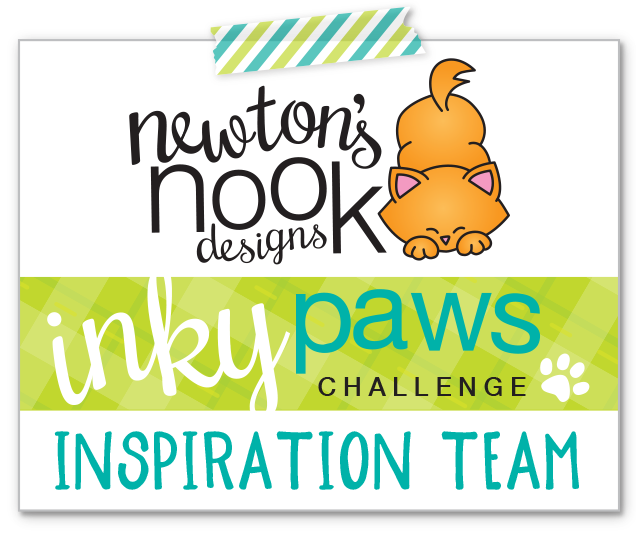 Today is the last day of the Newton’s Nook Designs April Release reveals. If you are a Newton fan like me, then I am sure you were waiting for what he is up to this month. He is celebrating friendship with a cute little stamp/die set. And as Mother’s and Father’s Day are approaching fast too, there are 2 new mini sets for the occasion. All new products will be available tomorrow, Friday 12/04! I stamped and coloured Newton with his bird friends and some additional birds and hearts too. I used the coordinating dies to cut them all out and set them aside until I worked on the background. On a white card base i masked off a strip and applied Salty ocean and Tumbled glass distress oxide inks. I was longing to try the new Hardwood stencil just to add texture, and although it is a wooden one, I used it to add more interest to my sky, so I used the same ink colours as before. After removing the stencil, I went back with the sponge applicator to make the lines smoother. I love the soft effect I get this way. I white heat embossed a sentiment from the set on a black banner (MFT Blueprints 7) and used 3D foam squares to mount the images and the banner. As a finishing touch I added clear shimmer to the hearts and covered them with glossy accents, just as the beaks of the nightingales. The sentiment is so pretty on its own, that i simply heat embossed it with gold embossing powder on Bristol Smooth cardstock and quickly coloured the flowers with ZIG Clean Color Real Brush markers. I die cut the panel with the scalloped rectangle frame die from the Frameworks die set and cut an extra 2 frames from Guava cardstock. I adhered the frames with liquid glue on top of each other for a dimensional look. For the background I used the fabulous Floral lace stencil with Worn Lipstick and Spun Sugar Distress Oxide inks but before removing the stencil I spritzed it with Tsukineko Shimmer Spritz. As a finishing touch I added Nuvo glitter drops to the center of the flowers. I had a ready background I made earlier with Nuvo Shimmer powders which i die cut with my favourite postage stamp die from Frameworks. Then I used the Frames Squared die set to partially die cut a rounded stitched rectangle as my focal panel. I used Kaleidacolor Blue Breeze to stamp the ombre sentiment and using my stamp positioner I also stamped it with Versamark ink so I could cover it with clear embossing powder and heat set it. I love the shiny raised look! I used my clear shimmer pen to add some sparkle to the fish and water droplets and matted the panel with a blue violet cardstock before mounting it on the background with 3D foam squares. Would you like to win the “Newton’s Birdhouse” Stamp Set? This stamp set will be given away to ONE lucky winner! Here’s how to win: comment on the NND blog and Design Team blogs (see list below)! The winner will be chosen at random from the collective reveal posts. Make sure to check out each of their blogs and comment for your chance to win. You will not know which blog has been chosen so the more you comment on the better your chances are of winning! You have until Thursday April 11th at 9pm EST to comment — winners will be announced on the blog post on Friday, April 12th.